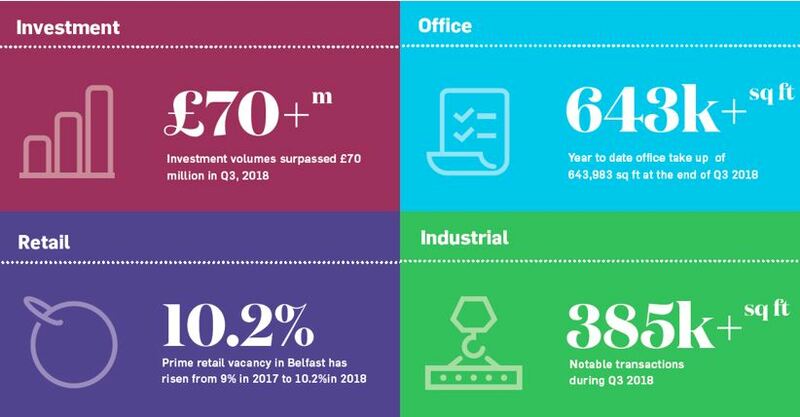 By the end of 2018, office take up in Northern Ireland totalled a record 885,000 sq.ft. according to research completed by leading commercial property agents Lisney. In a sector becoming more and more dominated by tech and digital companies, the market is also witnessing a pressing demand for serviced offices and co-working spaces which is expected to continue in the coming years. “Q4 saw a flurry of investment product come to market with annual transactions totalling £165m and the sale of Bow Street Mall to a private investor for £12.25m recorded as the largest transaction of the quarter. “The office sector has performed well with investment in the sector achieving good depth of local, national and international demand demonstrating liquidity for good quality, appropriately priced product. Opportunities for the region can therefore remain by maintaining the discount or ‘yield gap’ between Northern Ireland and rest of the UK. “Notable transactions include the sale of The Metro Building for £21.9m and the sale of Obel 68 for £15.2m. However, the lack of new office stock has remained an issue in 2018. “Office supply will be bolstered by refurbished buildings such as Chichester House and new schemes such as the ‘Sixth’, City Quays 3 and Castlebrooke Investments’ ‘Tribeca’ that will include 1,500,000 sq. ft. residential and office space with retail and hospitality space with the first phase including two Grade A office buildings extending to 180,000 sq. ft. The retail sector in Belfast city centre experienced a significant downturn in footfall in Quarter 3 and into Quarter 4 following the fire in Primark located in the Bank Buildings. “It’s no secret 2018 has been a testing year for retail in Belfast with completely unexpected circumstances thrust upon the city centre. “Not surprisingly activity has been slower than anticipated. However, there is evidence of a number of retailers pursuing new opportunities on our high streets, shopping centres and retail parks. Irish department store Guineys opened its doors in Belfast as did Matalan in CastleCourt, and out of town Brand Max, the Mike Ashley-owned discount fashion retailer, entered the Northern Ireland market in Connswater Shopping Centre. “Interestingly the food and beverage sector has continued to be buoyant with a number of outlets incorporating a drive-thru offerings to customers. “On an industrial front, requirements have been driven by retail nationwide distribution and this is very much in line with activity in the rest of the UK. Amazon has already set up shop in Titanic Quarter’s Channel Commercial Park and we believe this is only the start of things to come as delivery-orientated purchasing continues to grow.